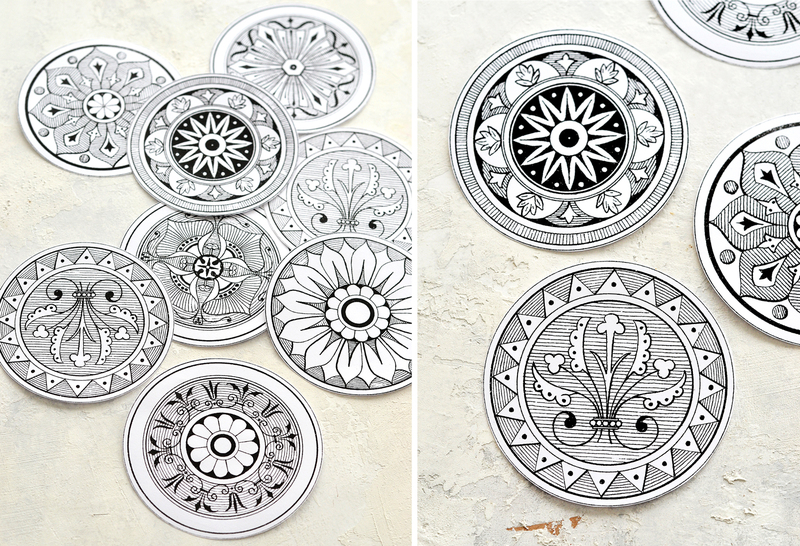 DIY Antique Adult Coloring Medallions & free printable! 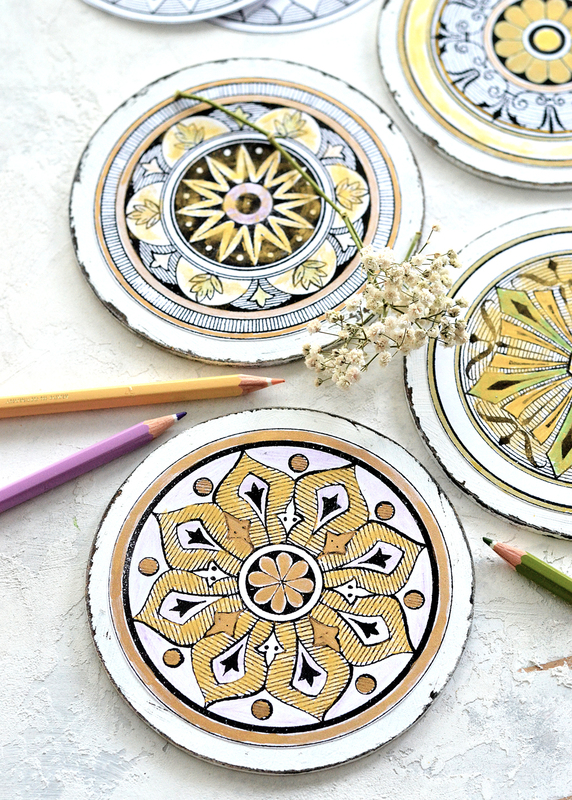 DIY Adult Coloring Coasters + free printable! I discovered the beautiful world of adult coloring pages a couple of years ago and I remember how pleasantly surprised I was to find this new way of relaxing through coloring. I bought coloring books, colored pencils, I even made a selection with some of my favorite 100 free coloring pages for adults and children and I shared it on my blog. It still is such a pleasant way to enjoy some of the free moments I have during a day – whenever I need to unplug and recharge my batteries. 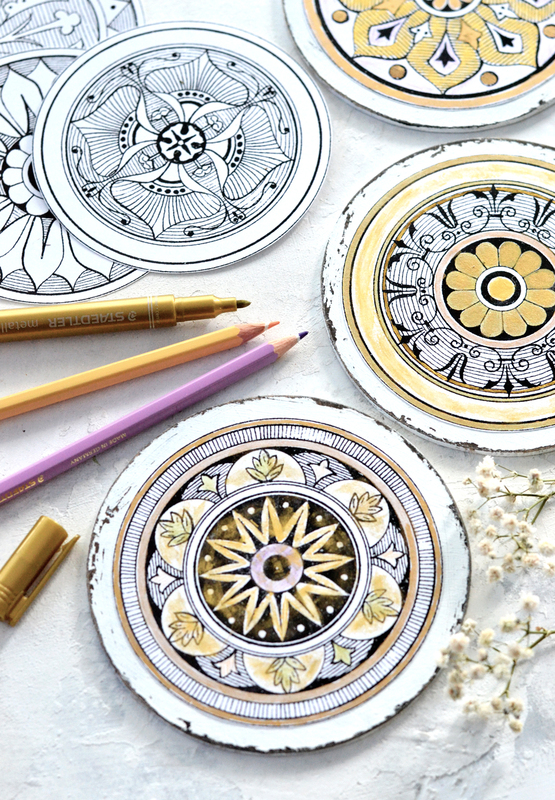 Ever since I saw these classy and elegant ornamental medallions on The Graphics Fairy, that looked like some intricate antique mandalas, I knew they would make the perfect coloring pages! So I gathered my favorites and created two printables for you (because I couldn’t decide on only one) – you can download them below. You can print them on regular paper, self adhesive paper or cardstock paper (like I did). I decided to use HDF (0.3 cm / 0.11 inches in thickness) for this project, but you can also use plywood or any other scrap wood you have around, even some old coasters that can be painted. 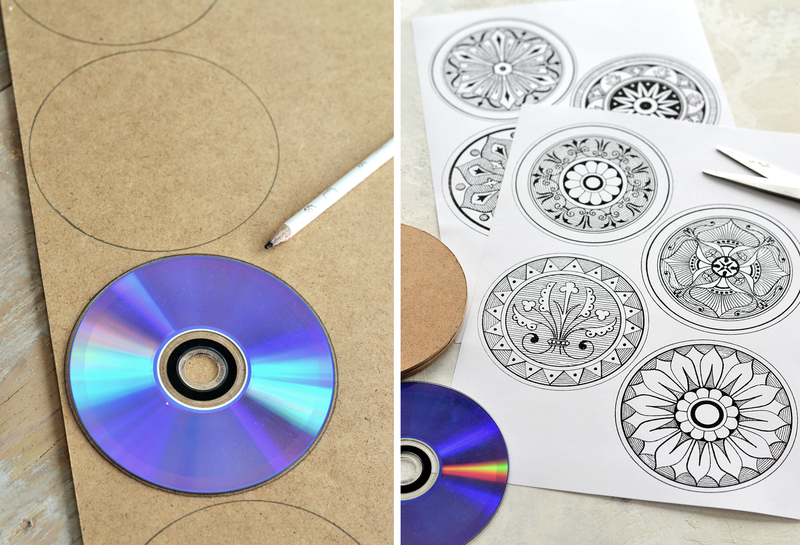 To make things easier for everyone, I used an old CD to trace 4 shapes (you can definitely make more) on the HDF board and I asked Mr. Dreamy to help me with this part. I put the cut images aside and then I move to painting the wood bases! I applied my fool proof technique of painting and distressing an object, because I also wanted my wooden bases to look vintage and chic! 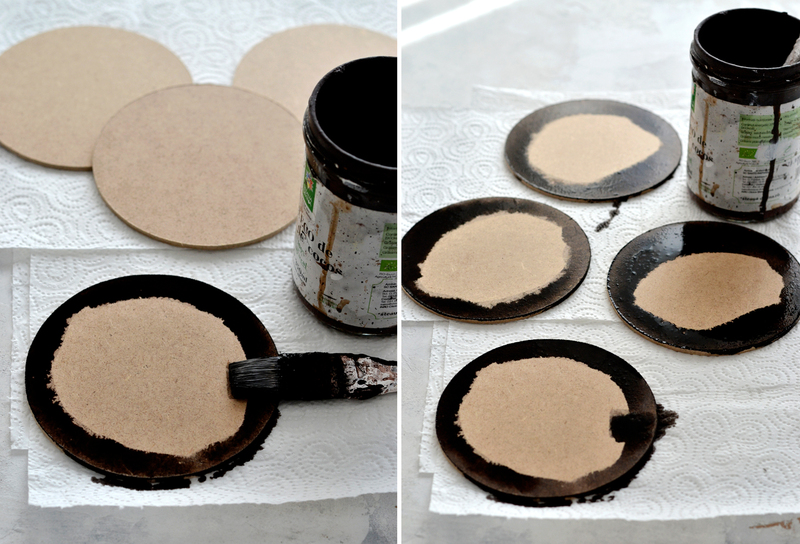 I used brown acrylic paint on the edges of the HDF circles and I let it dry completely – you can use any other types of water based paint. Rub some candle wax (just a simple white candle) on the edges – that will help when getting to the distressing part afterwards. 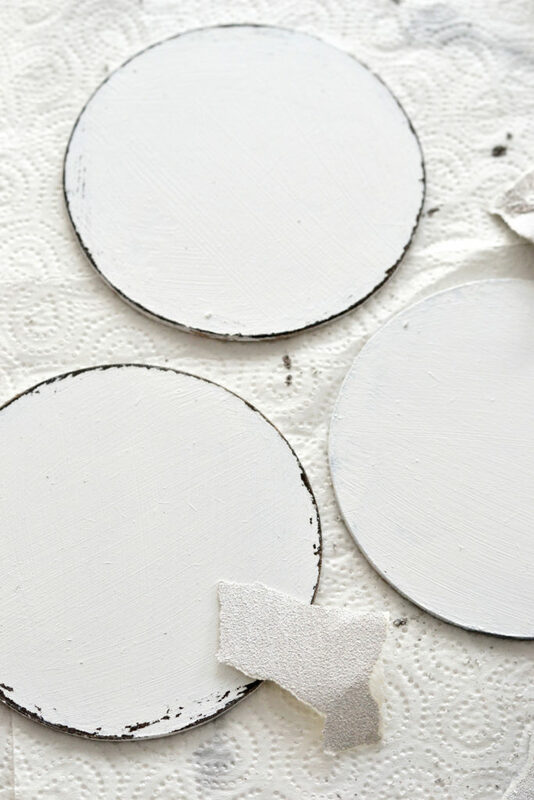 Apply white acrylic paint and let it dry completely. You might have to apply another layer of white paint to get a great coverage, like I did, just make sure everything is completely dried before moving to the next step. 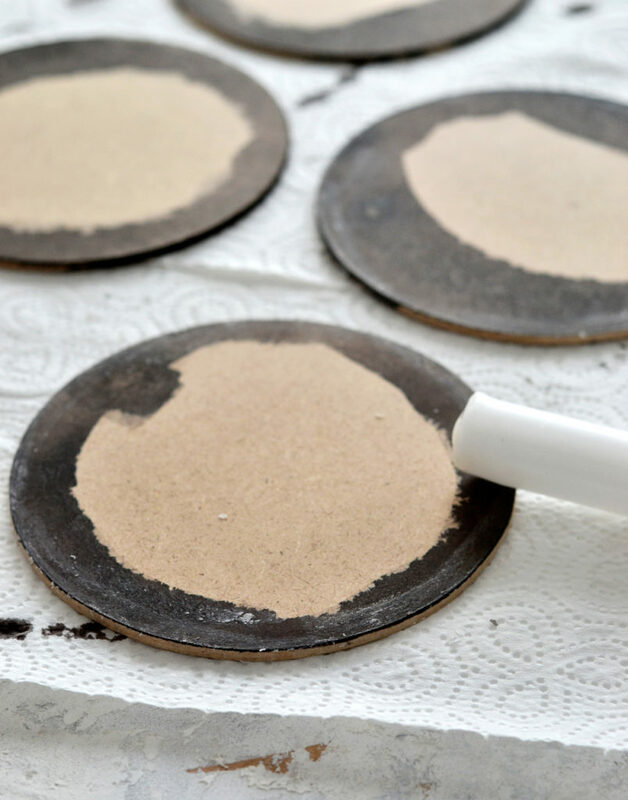 Use sandpaper to distress the edges to your own liking – just a little or go crazy 🙂 Use a cloth to clean the surface and remove any impurities. 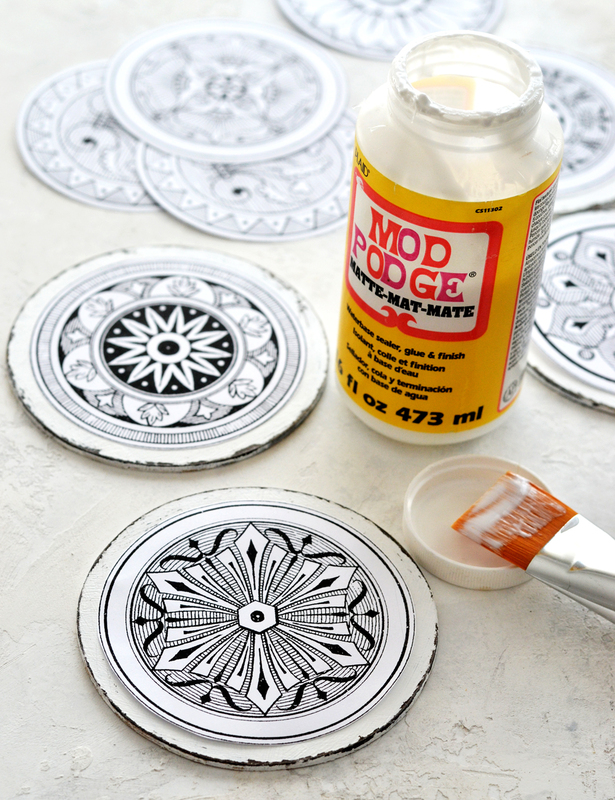 Apply a thin layer of Mod Podge on the back of the printed paper and carefully air center and place them on the HDF circles. Use your fingers (or an old credit card) to gently remove any air bubbles, starting from the center of the image, then moving outwards. 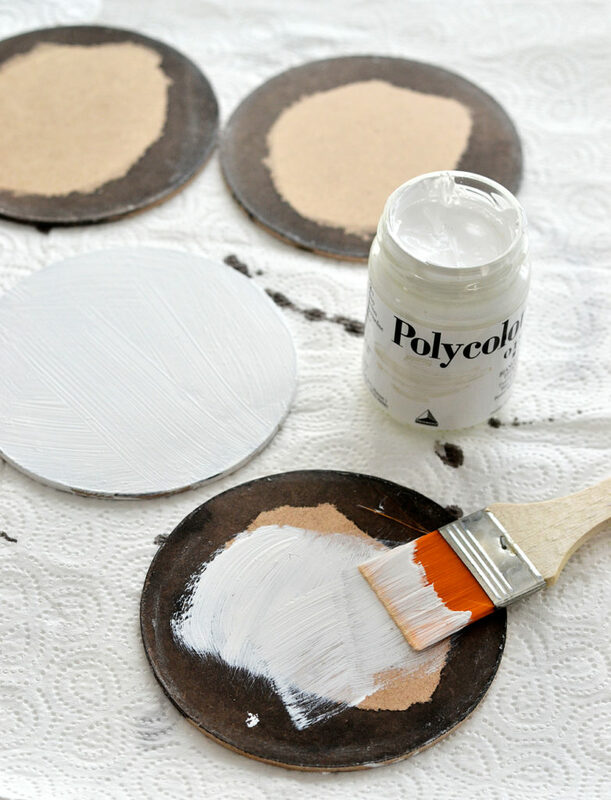 Let the Mod Podge dry completely, then you are done! 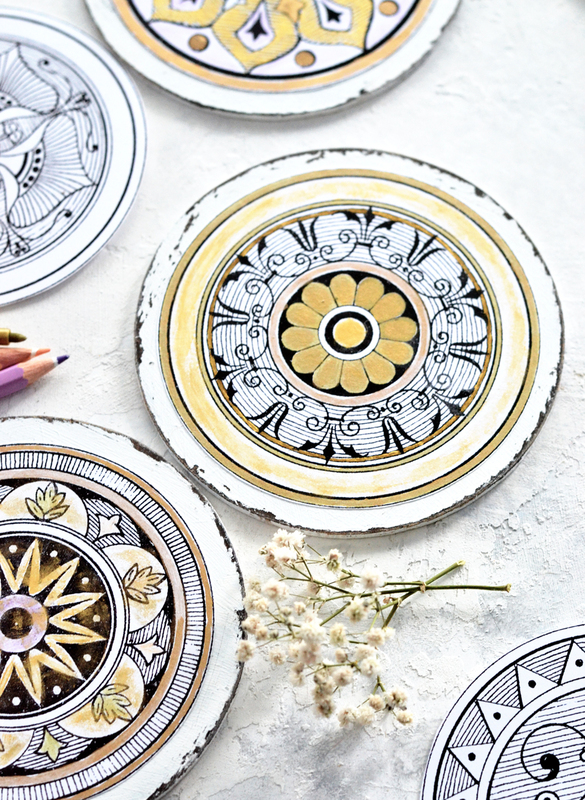 you have the opportunity of playing with different coloring and writing utensils, even different mediums – you can get really crazy here and use whatever you want: colored pencils, markers, fine pens, metallic gel pens, brushes, acrylic paint, watercolors, even coffee or tea, the sky is the limit! I have a thing for gold lately so I used gold in different shades and a few other colors that I thought would work with gold. 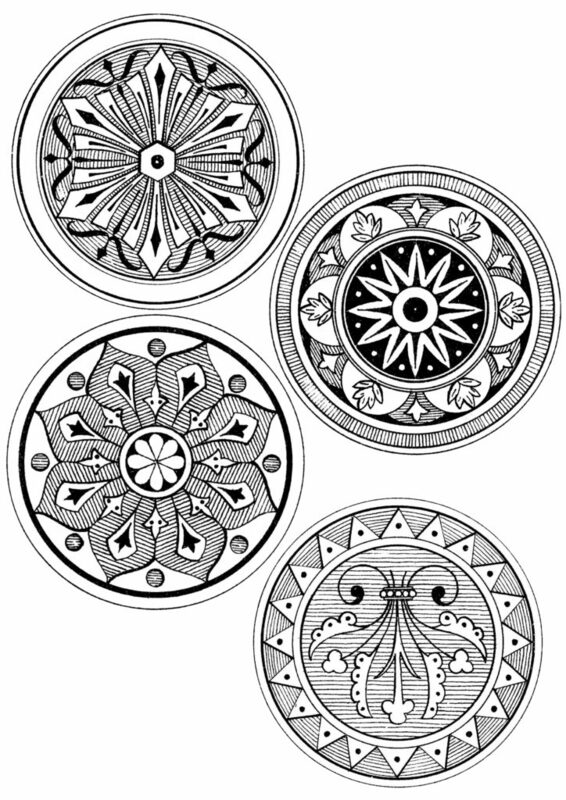 And that would somehow complement the whole DIY Antique Adult Coloring Medallions concept, turning them into unique pieces of art! 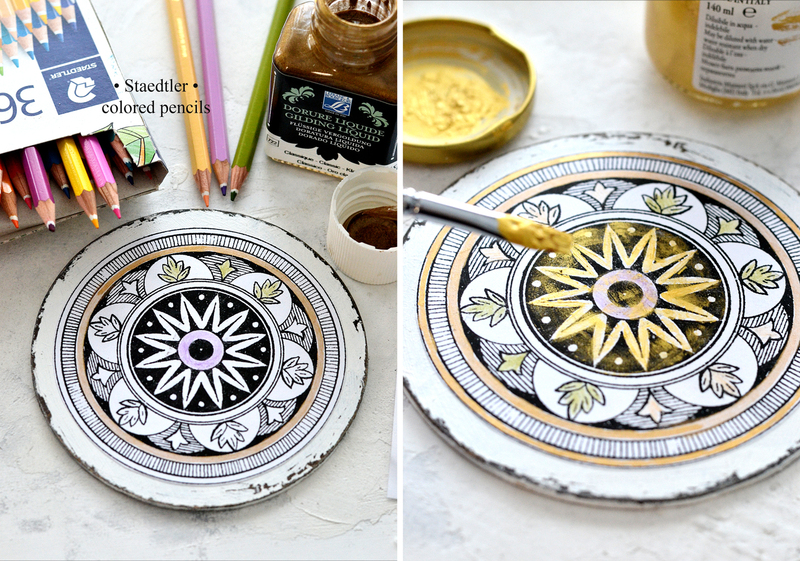 For this particular antique mandala I first used a Faber Castell grip finepen (brown-gold) and an Edding metallic gel pen (gold) to trace and color some of the beautiful details. 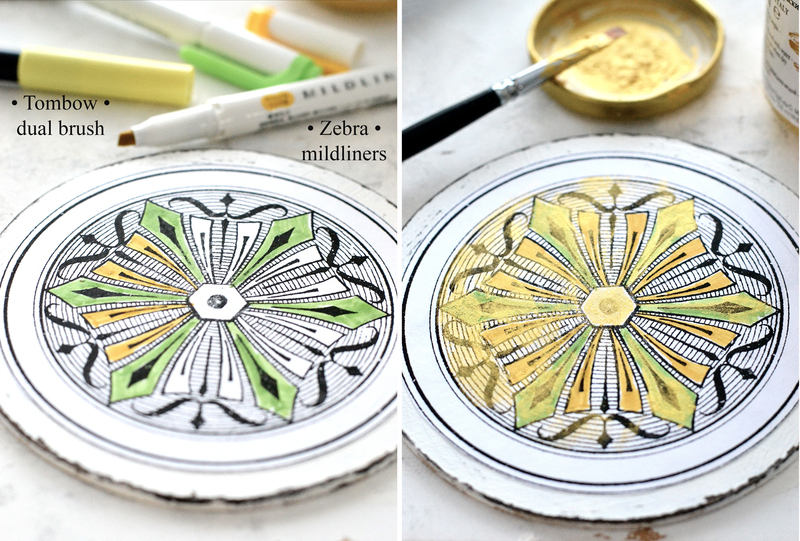 Then I used a Staedtler metallic marker (gold) to color the inside petals. And finally, I used the Maimeri Polycolor acrylic paint in a beautiful pigmented light gold and I dry brushed it here and there. This paint is really one of my all time favorites, because you can create some stunning effects and highlights. 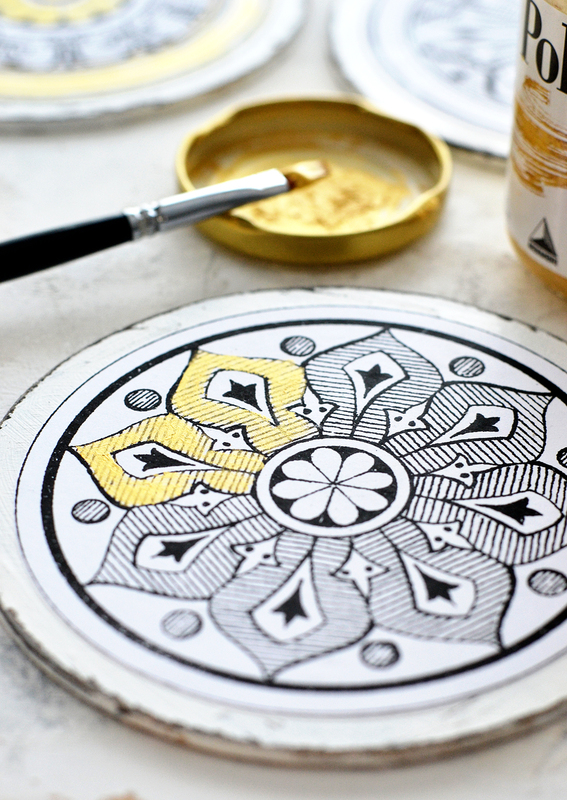 For the next medallion I started with the same acrylic gold paint. 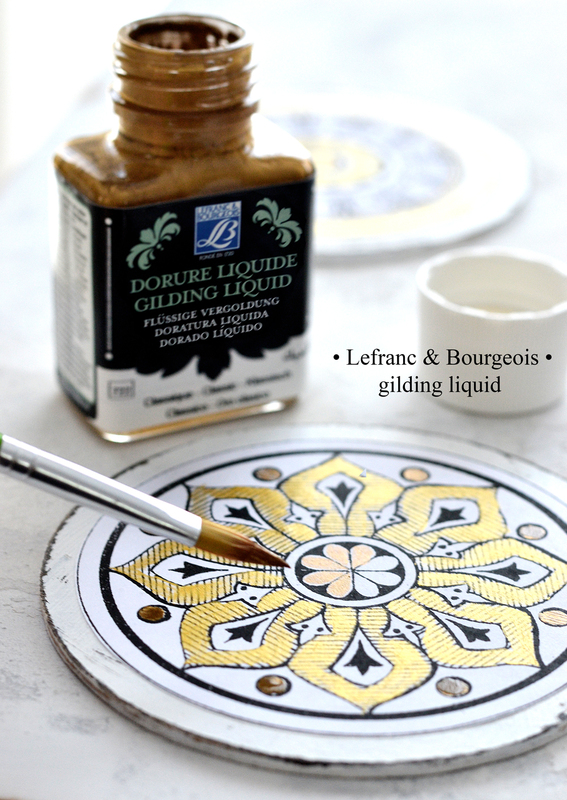 Then I continued with another favorite – liquid gold! This one has a different shade and I managed to create some beautiful accents. 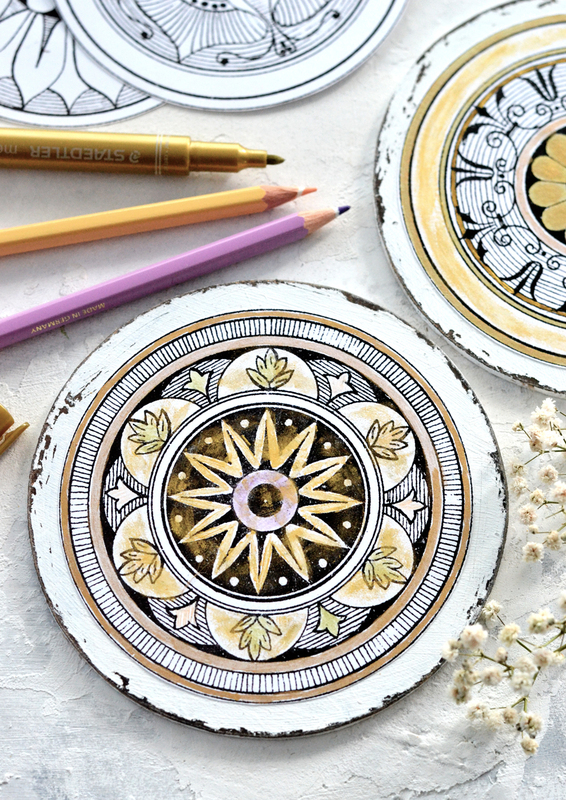 Moving to a new antique mandala, this time using colored pencils! 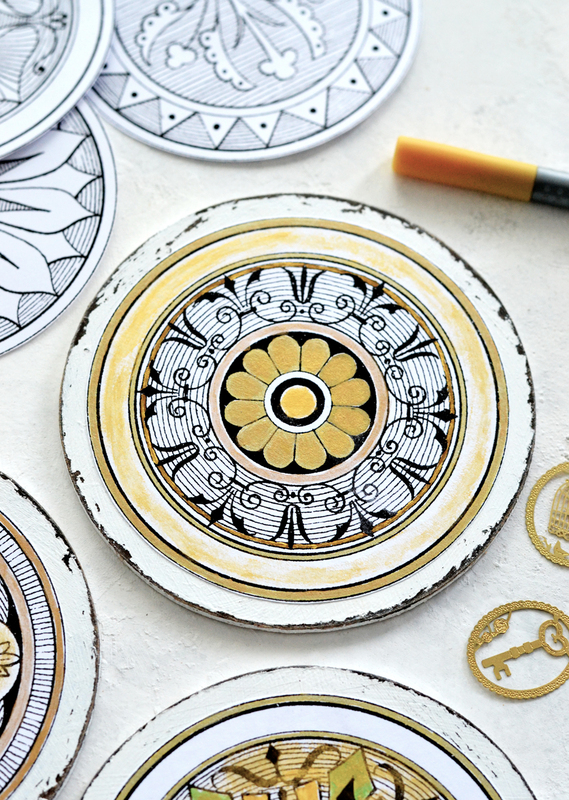 What would the DIY Antique Adult Coloring Medallions be without some colored pencils, right? 🙂 I used lovely pastel colors that looked almost vintage. To continue with the whole golden look, I also used liquid gold for coloring and I even dry brushed some of that light gold acrylic paint on top, to add interest. Next, colored markers! 🙂 To be more exact, the lovely Zebra mildliners that are great for coloring! And some more dry brushing with gold to tone down the marker colors and create more of those beautiful golden highlights. As you can see, there is plenty of room for further experimenting and getting creative! And even though everything starts with the same printables, each and every one of you will be able to create something truly unique! 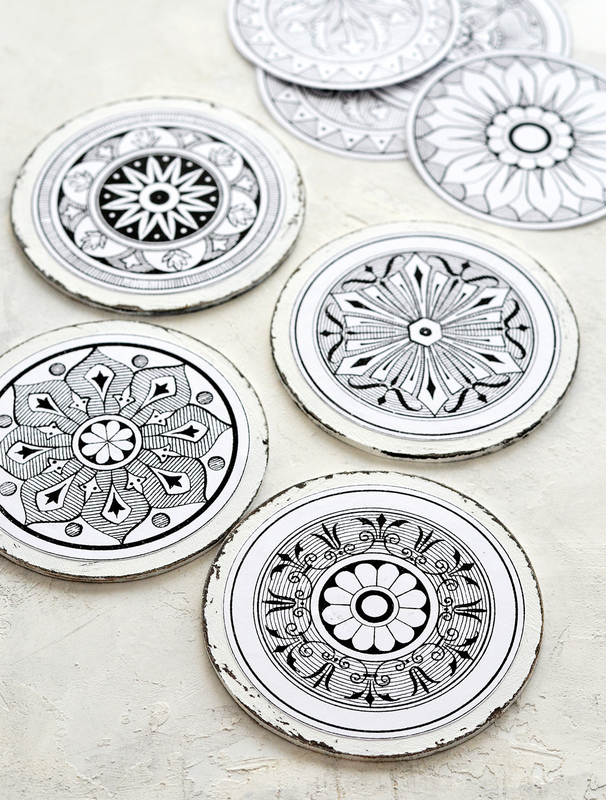 You can integrate the chic medallions in your home decor afterwards as individual pieces or as a set. 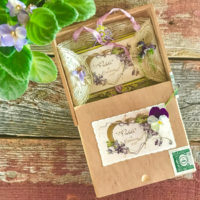 You can pair them with vintage books, turn them into large labels or tags and decorate different sized boxes. You can even put them in your Christmas tree as ornaments! 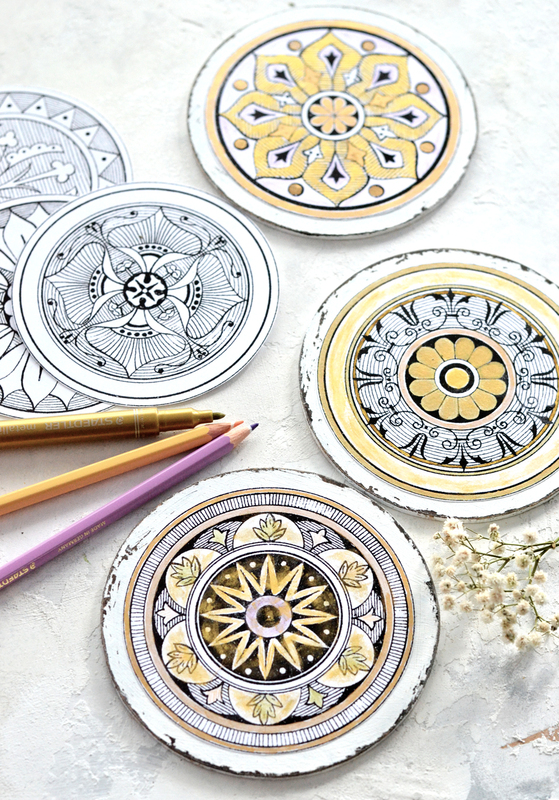 The DIY Antique Adult Coloring Medallions can also be used as coasters, as long as you are using something to protect them after coloring. I would suggest one or two layers of Krylon acrylic matte spray, just make sure you do a quick test before on a piece of paper to see how it interacts with all the coloring mediums you have used. 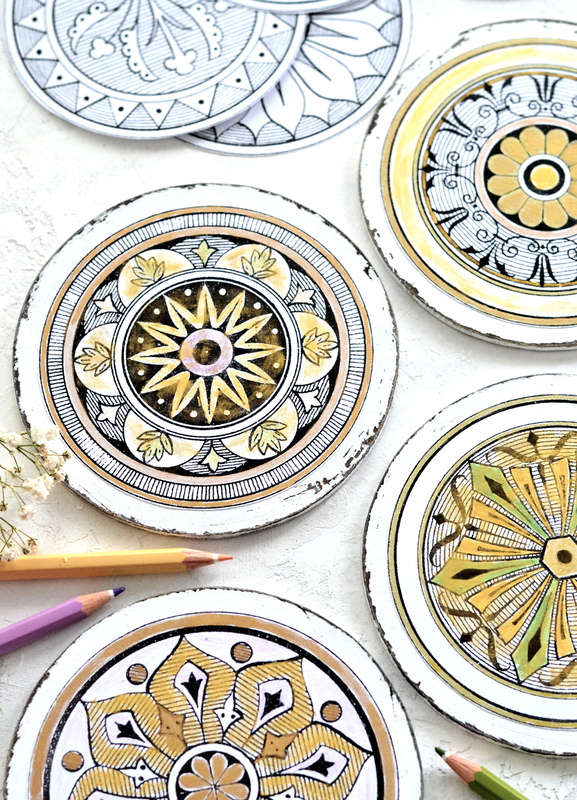 And if you are looking for a sensational and meaningful gift that would also encourage family members or friends to get creative… turn the actual DIY Antique Adult Coloring Medallions into presents! 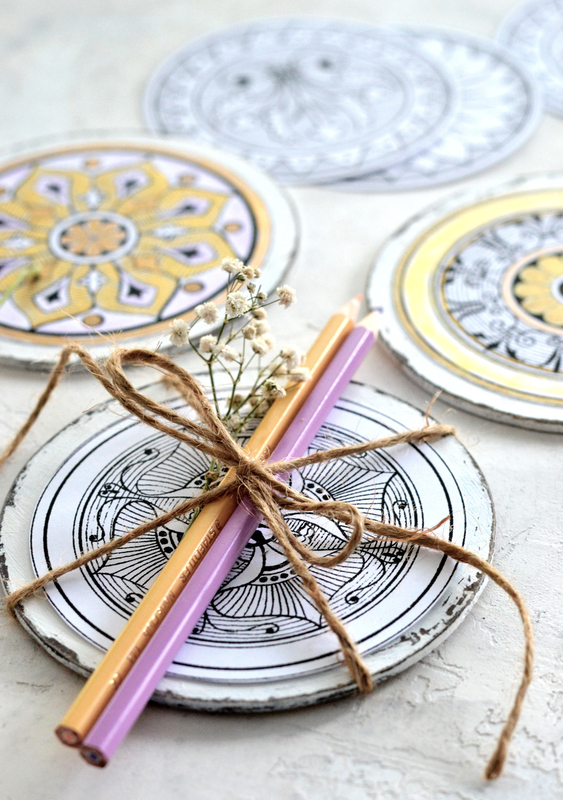 Make the wooden base yourself and wrap it along with a non colored antique mandala and some colored pencils, maybe even some dried flowers or small branches and some twine. You’ll have the most amazing gifts! 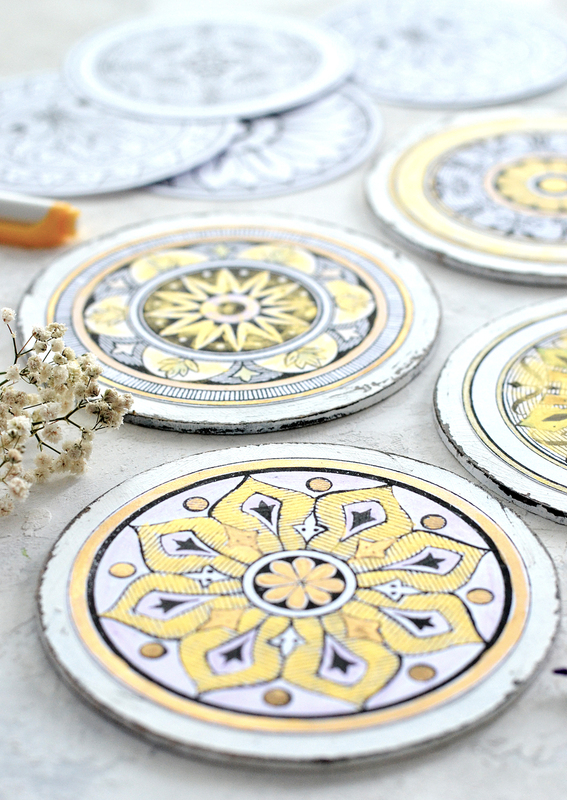 The ugly weather outside is already forcing us to spend more time inside, so I’m really hoping you will find my DIY Adult Coloring Coasters inspiring! 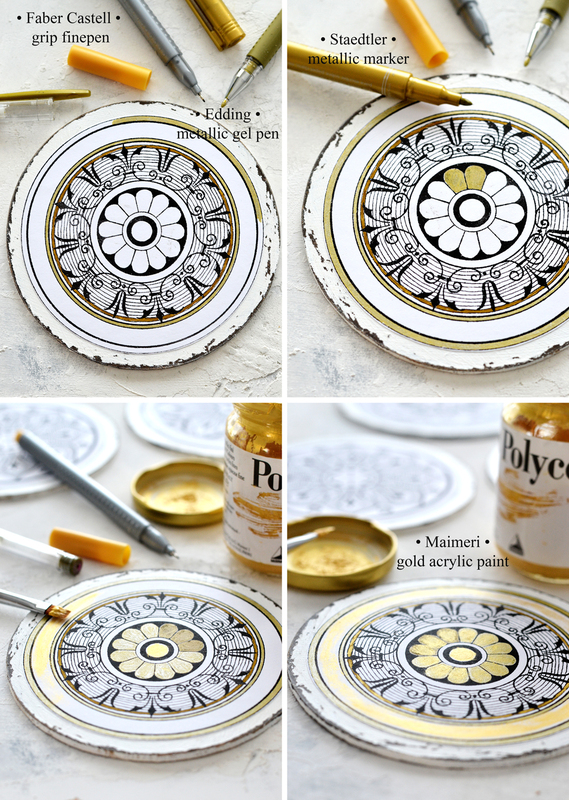 DIY Victorian Calendar – Mixed Media Tutorial! 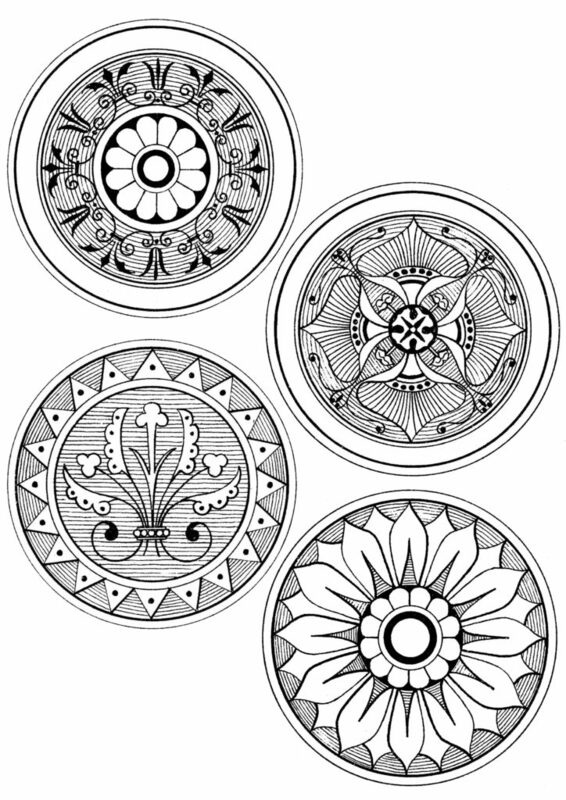 Morning Glories Coloring Page Floral Coloring Page Wild Geraniums! « Delightful Vintage Mother and Son Silhouette Image!